A Victorian greenhouse is a stylish replacement to a conservatory. Ideal for growing exotic plants in all seasons, such a greenhouse can certainly make a statement in your yard – and not only. This type of structure can easily be transformed into a cozy corner that raises the curb appeal of your property. But with dozens of models available on the market, how to choose the best one? Victorian greenhouses are not exactly cheap, therefore it pays to have a clear picture of what to look for. To help you with your choice, we’ve put together this guide of the best Victorian greenhouses for decorative plants. See what features to look for or, if you’re in a hurry, click on the links below to check out the specs and characteristics of our top picks. Today’s market is full of greenhouses. There are dozens of models from portable to permanent, from plastic to glass. Prices vary widely and given the costs of a Victorian greenhouse, you might be wondering why to invest in one. I wouldn’t recommend investing in such a planthouse if you want to grow vegetables during winter. There are cheaper structures to consider for this purpose. However, if you’re planning a landscape redecoration and are looking for a fashionable structure to enhance the look of your property, a Victorian greenhouse could be your best bet. Stylish and elegant, Victorian glasshouses are inspired by the British tradition. Emerged as an alternative to the traditional arboretums in an era when English nobles were trying to grow citrus trees in their backyards, these structures maintain much of their original charm and are ideal to grow exotic plants, citrus trees, or decorative plants. Victorian greenhouses are usually spacious enough to accommodate an armchair or sofa; this allows homeowners to use such a structure to enhance the beauty of their landscape. And ultimately, this type of glasshouse can even be used to replace the traditional conservatory extension of a home, when the structure of the building doesn’t give you the possibility to enlarge the existing construction. Modern Victorian greenhouses are intended as semi-permanent structures, that’s why the quality of the materials matters. Then, there are other things you should consider before investing in such a structure. Most Victorian greenhouses come with an aluminum or steel frame, a solid foundation and glass panels. Some structures have polycarbonate windows, which represent an excellent replacement for glass. However, if you aim to have a better temperature control, glass is recommended. If choosing a model with steel frame, make sure the steel is powder coated with epoxy powders. This coating protects the steel from weather and environmental elements, preventing rust. There are dozens of models of Victorian greenhouses. Some of them have simple, rectangular layouts. Others have church-style layouts. Choosing a style over another is a matter of preference and space. If you have a large yard, the choose whatever style you like. In a restricted area, a rectangular greenhouse adapts easier to the available space. A regular footprint is also more space-effective than an irregular shape. If you’re aiming to grow exotic plants, a mist system could be essential. This system allows you to recreate tropical conditions in your greenhouse. High humidity will make your plants thrive and in most models, you can even install a temperature control unit. Temperature control might or might not be needed, depending on where you’re living and whether you want to maintain your plants outdoors in the winter. Manufactured in Europe by Janssen of Belgium, this Royal Victorian Orangerie is a stylish glass greenhouse designed to bring the old-fashion English style in your backyard. This beautiful structure is spacious enough to accommodate a host of plants and a cozy corner. Measuring 10ftx16ft, this glass greenhouse comes with a dark green aluminum framework, a thick gauge and 4mm tempered glass panels that ensure sufficient temperature insulation. The 5-foot tall clearance ensures plenty of headroom and in the highest point, the structure is 8 feet tall. The decorative roof fringe adds some European sophistication to this structure, while sufficient ventilation is ensured by an automatic and a spindle window. Another thing we like is the interior shade nets that open and retract easily. Adjustable independently, these nets ensure comfort and protect the plants from harmful UV rays. Access is ensured by large doors and the manufacturer offers the possibility to add additional doors if needed. The product is also available in black, in case you’re looking to add true Victorian elegance to your landscape. Structure: this Belgian greenhouse is a first-class product that boasts a stable semi-permanent structure. Easy to erect and easy to dismantle. Windows: all windows are made of 4mm tempered glass and are designed to ensure proper thermic insulation. Ventilation is ensured by an automatic and a spindle vent. Customizable: the manufacturer gives the possibility to customize the frame with additional doors. It is also possible to change the configuration of windows and doors. Shades: ideal for an Orangerie, this Victorian greenhouse comes with two interior shades controlled by curtain rods and that are easy to adjust independently. The price of this greenhouse is hard to justify. 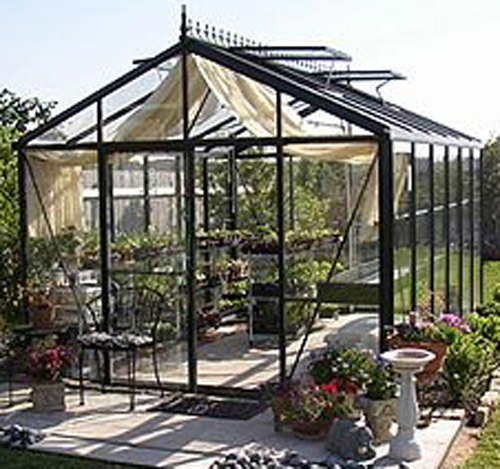 Exaco VI34 is a rectangular Victorian greenhouse to consider for your backyard. Measuring 10,2x15 feet, this greenhouse offers plenty of growing space. The 9-foot clearance and the 4 automatic roof windows add versatility to the unit. The modern automatic window opener opens the windows when the outdoor temperatures start to rise. An old-fashioned spindle window is also available if you need more ventilation. Easy access is ensured by a large sliding door. The greenhouse is easy to erect and can be dismantled if needed; the frame is made of sturdy aluminum coated with epoxy powders. A dark green finish adds elegance to this piece, while tempered glass windows provide a better temperature control than polycarbonate. However, polycarbonate windows are available if required. The configuration of the doors is also easy to change, while a second door can also be installed upon request. This product is manufactured in Europe and installation is available if needed. Sliding door: this greenhouse comes with a sliding door that can be placed in any vertical glass location, either at the front, at the back or on sides. Foundation: this greenhouse comes with a sturdy 6-inch foundation frame and a resistant aluminum frame coated with epoxy powders. Misting system: creating a mist of humidity in which your exotic plants can thrive is easy. Just connect a garden hose to the faucet. Installation: the greenhouse is easy to install and comes with comprehensive instructions. However, professional installation is also available if needed. Some finishing details are less flattering than expected. Boasting a traditional design and a stylish decorative roof, this Victorian glass greenhouse can certainly add a touch of sophistication to your backyard. This product comes with a sturdy aluminum frame powder coated with a deep-green finish that provides a long-lasting beauty. A thick gauge and two full-length gutters and downspouts prevent leaks, while two roof windows with automatic opening devices ensure ventilation when outdoor temperatures rise. The panels are made of 4mm-thick tempered glass that provides an excellent insulation. Secured in place with heavy rubber sealing, the glass panels are also sturdy enough to support snow or other weights. A thing we like is the sliding door that can be installed on any of the four sides, while the included misting system keeps your plants thriving season after season. Accessories include a large seedling bench and a full-length accessories top shelf that match the color of the frame. Versatility: this Victorian greenhouse comes with a sliding door that can be assembled on any of the four sides. Vents: two roof windows provided with automatic opening devices regulate the temperature and humidity inside the greenhouse. Accessories: the greenhouse comes with a large seedling bench that runs the length of the greenhouse and a full-length top shelf for gardening accessories. Shade nets: the unit also has two shade nets which are easy to control independently from pull cords. Assembling the structure is a hassle due to inaccurate instructions. Another Victorian greenhouse that impressed us with its characteristics is this Junior Orangerie. Boasting an elegant black aluminum frame and tempered glass windows, the greenhouse has a beautiful T-shape layout and looks amazing in a larger backyard. The structure offers plenty of growing space and sufficient head clearance to accommodate all people. We like the interior workspace that offers a full view of the surroundings, while the sliding door ensures easy access. This kit includes a solid base foundation and a durable frame, 4mm tempered glass panels with automatic roof vents, a great gutter system and interior shade nets that protect the plants from harmful UV rays and provide a pleasant shade. We also like the design; respecting all traditional elements of a Victorian greenhouse, this product has a beautiful fringed roof. The structure is also easy to erect thanks to comprehensive instructions delivered in print and on DVD. Accessories: this greenhouse comes with a large seedling bench that attaches to the frame. The bench comes in the same color as the frame. Assembly: the unit is easy to erect and fairly easy to dismantle. The kit contains everything needed for the purposes, including anchor stakes. Sturdiness: Junior Orangerie is a greenhouse made to last. The solid structure withstands all weathers and elements. Automatic vents: when the weather heats up, ventilation is ensured by the automatic roof window openers. The T-shape occupies a larger space than a traditional rectangular shape. Exaco VI23 is another royal Victorian greenhouse that impressed us. A smaller footprint makes this structure ideal for a small backyard. In detail, the unit measures 7,9x10,2 feet for a total growing space of 80sq.ft. Similar to the models above, this greenhouse has a customizable layout and the sliding door can be placed either on the front, at the back, or on the sides. Ventilation is ensured by two roof windows with automatic openers. A sturdy frame made of aluminum and a solid 6-inch foundation give stability to the structure. The greenhouse withstands adverse weather and elements. Moreover, the unit is also easy to assemble and dismantle. And if you’re not quite confident in erecting the greenhouse yourself, there is an option to ask for professional installation. Just contact the reseller in the US to benefit from the service. Size: this greenhouse is compact yet spacious enough to offer plenty of growing space. It roughly measures 8x10 feet. Style: this old-fashioned English greenhouse can certainly bring style and charm to your outdoor space. The structure preserved all elements of a traditional Victorian Orangerie. Glass panels: designed to provide an excellent temperature control in all seasons, the unit comes with glass panels and automatic roof vents. Sliding door: easy access is ensured by a sliding door that can be installed on any side. This allows you to adapt the greenhouse to your needs. The professional installation adds up to the cost of the greenhouse. It might be expensive, but the Victorian greenhouse we like best is the Royal Victorian Orangerie by Janssen of Belgium. Manufactured in Europe and designed to bring the old-fashioned English style to your backyard, this elegant structure offers plenty of growing space and works wonders in all landscapes. The unit has a footprint of 10x16 feet and is 8 feet tall. A solid aluminum framework is available in either black or dark green, 4mm tempered glass panels provide excellent temperature insulation, and an automatic and one spindle window ensure sufficient ventilation. With a decorative roof fringe, adjustable shade nets, and an elegant sliding door, the greenhouse makes an ideal conservatory. And you can even customize the design according to your needs. The manufacturer offers the possibility to add additional doors if needed, or you can change the original position of the door to fit your needs. Yes, this Victorian greenhouse has a hard-to-justify price. But if you’re looking for a stylish structure to beautify your outdoors, this Royal Orangerie could be your best choice. What Does a Greenhouse Cost?